Where do you want to spend your St. Patrick’s Day? Avoiding the drunken revelers on the street, that’s for sure. Hide from the masses and join us for a special evening of music at the house of playwright Barrie Cole. We are on the bill with Ruben Whitaker’s band, From the Start. Charm and good company will abound, rest assured. To get the address, drop us a line at crookedmouthband at gmail dot com. We are back at the Wishbone, one of our favorite venues to play. The room is warm, in sound and in feel, and the food is delicious. Those of you with kids will be pleased to note that it is not a school night, finally. Come on by and raise a glass and maybe a fried chicken leg. No cover! Drink and be merry and maybe we will pass a hat around. Heather Riordan is in the house, raising up our two sets of music with her ample accordion skills. Help us ring out another successful Rhinofest with a musical celebration of art and artists. October seems to be a particularly auspicious time for Crooked Mouth and ESS—playing shows here in the Halloween month is becoming something of a tradition. Join us for two nights of music, with new stuff and special guests! ESS is a sonic Chicago institution and we love working and playing with them. The Crooked Mouth returns to Prop Thtr for another Sunday evening of music and banter. Something about the Prop space kicks Beau's improvisational storytelling into high gear and there is no end to the entertainments spilling from his lips. As an added bonus, Maci Greenberg and Zoe Miller will open for us with a short set of covers. You don't want to miss this. Tickets are $15 or pay what you can. Always and forever. We are closing out the Rhinofest with a selection of songs, new and used. Our very excellent friends, Eve's Undoing, will be joining us, and there will be libations and probably cake. Lots of birthdays to mark! Tickets, as ever, are $15 or pay what you can. The Crooked Mouth will be the February 17th guest at Cabaret Prop'd! The Prop Thtr's curated variety show running every Friday throughout the festival. The weekly delights feature Yves Francois(music), Viktoria (dance), Diva La Vida (burlesque), Emma Bice (hoop), Jill Erickson (story), Robin Fine (poet), AlleyCat (dance), and Improper Behavior (band), along with a different guest band. Visit the rhinofest calendar page for a full schedule! Help us kick off the 28th annual Rhinoceros Theater Festival with the traditional opening night Vaudeville. The guest list will be varied and excellent, as ever, hosted by us truly. Come early, because it always sells out. Tickets are $15 or pay what you can! Be sure to check out the full Rhinofest schedule at the link above. Lots of excellent work to sample and savor. We sure do love playing in a living room--intimate, quiet, cozy. Just right for a January Saturday night. Come on over to Brook's house and we will sing for you. Maybe you will sing for us to. However it goes, we will be together. And that is the point. Admission is free. We will pass the hat a time or two. See you there. It's our first show after a summer hiatus. We have new songs for you, and you know how much you love the acoustics in a church, so please, come on over! Join us at Prop Thtr for an open rehearsal during the Avondale Northwest Arts Connection "crawl" event. Neighborhood arts organizations are on site to share information and interact with patrons. Find out about the not-for-profits in the area while we work on new songs and fine tune existing ones. Take a look at this picture of 80 Foots per Minute. Are they not the finest looking string band in town? They are. And we get to play with them, in the house of Emmy Bean (with the flower in her hair) and Ira Murfin (not pictured, but also a fine looking gentleman). Our lovin' T-Roy does double musical duty this night, so we will be sure to keep him hydrated. Our last time round in this venue was a delight, and tonight will be no different. Join us! More good musical times to be had at our home-away-from-home, Prop Thtr. We will be joined by Eve's Undoing, if the stars align. Let's hope they do! Hip hop meets doo wop, as members of The Push Push and Midnight Moxie join forces to create the jammingest jam band ever. It's the musical version of Reese's peanut butter cups and you do not want to miss it. Come on by the Prop Thtr, as poet and singer Willa Moore and singer/songwriter Diana Laffey join us for a double bill of audio pleasure. New vaudevillian Plucky Rosenthal joins us for week 3 of the music series. Throughout the Rhinoceros Theater Festival, the Crooked Mouth will share a musical Tuesday evening with a special guest. This week features our old friend, Jeff Kowalkowski. He's a brilliant pianist and composer, member of Jack the Dog, Lucky Pierre, King Pignacious, and other projects. He's also working with us on engineering our new record. Check back to see if week 3 brings another Jeff with it! Join us at the Side Project as we shepherd in the holiday season with lovely people, words, and musics. We will be joined by Andrew Calhoun, clan matriarch, Winifred O'Reilly, and Janet Sayre. Jenny will lead us in some caroling, and that, friends, is as warm and wonderful as it is likely to get this winter. Mat Rieger's newest theatrical offering, Playing God, opens at the Prop Thtr in October for a 6 week run. In the spirit of Thanksgiving weekend during that run, we will play a late night after-concert. The time on this entry says 10:00pm, which is an approximation. We'll be setting up and be ready sometime after the play is over. Could be 9:45, could be 10:15. (It won't be 10:15.) What you really should do is come and see the show and then you will already be in place and you don't need to trouble yourself further about time. What is time, anyway? A construct. An inconvenient construct. Tickets are $15 or pay what you can. As ever. Crooked Mouth is road-tripping it back to our favorite place in Madison, Wisconsin: Mother Fool's Coffeehouse, whose proprietor, Jon Hain, also runs our record label, uvulittle. We will be joined by Wendy Bugatti! Come on along for the ride. We are back at the Prop for our final show of the summer, following the critically-acclaimed Curious Theatre Branch production of Black River Falls. Come and see the play, stay for the music. There will be refreshments both artistic and physical. It's another show at our beloved Prop Thtr, celebrating, as we do in the merry month of May, the collective birthdays of Beau and Jenny. We'll have some new songs and we'll be joined by our old friends, Eve's Undoing. Taking over the Side Project for one Friday evening during the run of Beau O'Reilly and Julia Williams' play, March. We will be joined by Eve's Undoing, a uke-centered band of great charm, featuring front man Jeff Weisfeld, his wife, Eve Ludwig, Mark Miller, Curtis Ruptash, John Beard, and Pickles O. That's right. 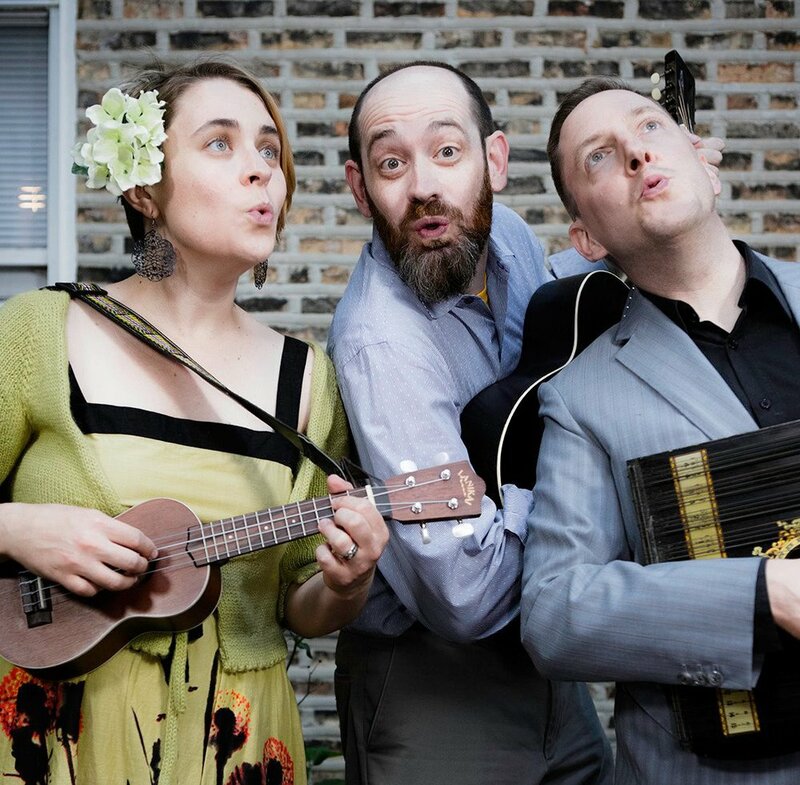 Chicago favorites The Dysfunctionells are reuniting for an evening of wonder and music at the Gallery Cabaret, and The Crooked Mouth gets to open for them. You know you want to see what Vernon Tonges will get up to onstage. He's not in town very often—don't miss your chance. It's our first bookstore gig, and what a bookstore it is. W&CF is a Chicago institution and a unique and excellent place to spend an evening. We will be joined by our friend and favorite performance poet, Sheila Donohue. We return to our home away from home in the heart of Logan Square. Hopefully, hostess Sheila Donohue will delight us with her latest work, and we will share two sets of new songs and crowd favorites. This is one of our favorite gigs, and our fourth time doing it. The weather is always perfect, and the music is always good. Join us. It's Beau's 61st birthday. Join us at Jamie's house in Lincoln Square for some glass and/or roof raising to honor the start of his 7th decade. The evening begins with the final performance of Judith Harding and Beau in Samuel Beckett's This Old Tune and Text for Nothing 1. They kill, and are not to be missed. After which, we will play a full set. Full! Call 773-203-7661 or email Jamie at roots@jamieoreilly.com for reservations and location information.